Winter can make you weary and summer can leave you limp, but spring — spring never gets old. With the years, we feel no diminished appreciation for the renewal of the earth, no lesser degree of elation at those early signs of returning life: the first robin, the first flower, the first blush of color along the treeline. If anything, they become more precious as we grow older and, presumably, wiser. By the calendar, spring began yesterday with the vernal equinox. But its true arrival is always an iffy thing, dependent on capricious March weather that only gradually steadies into a warming trend. Already though, you can feel that things are on the move. Slender wands of weeping willow suddenly stand out in the landscape, a cascading fountain of pale gold. Daffodils are pushing stalwart leaves and stalks through the leaf litter, and lawn grass is losing its winter pallor, looking more green now than brown. After weathering winter’s snow and ice, we are at the prelude to spring, here in late March. It is a pregnant moment, as in the theater when the house lights have dimmed, but the curtain hasn’t yet risen. Anticipation quickens the pulse. I’ve already seen my first robins, bouncing around the yard like they own it. A closer inspection of the ground reveals the pushed-up paths of moles, competing with robins for the worms, which have left their own early calling cards in myriad piles of castings dotted across the warming soil surface. Seeing that the moles and worms are afoot, so to speak, reminds me that migration can be vertical, as well as spanning latitudes. Those red-winged blackbirds screeching in the hedgerow have made it back from their winter vacations in Venezuela, but who's to say the worm’s progress from the depths beneath the frostline is any less arduous, any less impressive? I have already had my first boldly-colored flowers, thanks to a new species, Iris histrioides, that I planted last fall. In the mysterious way of bulbs, these were tiny green noses poking through the mulch one day, 6-inch stems with perfectly formed buds a day or two later and full-blown flowers the next time I looked. This little fellow is named ‘George,’ and he lives up to his advance catalog billing as a flower in "a mouth-watering shade of purple." ‘George’ showed up this week in sheltered beds on a south-facing slope. 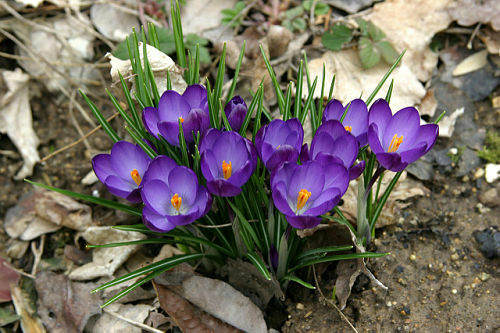 The only guests who beat him to the party are the diminutive crocuses, yellow and lavender and white, appearing in small clusters in my entry garden. Soon we’ll have more of those days when the sun warms us through our clothes, when the air is soft with the fragrance of early flowers and warm earth, when the birds return in a chirpy mood, filling the woods with melody. Soon, soon. It’s coming, with an inevitability that’s deeply gratifying. "At the top of the list stood the blooming of violets and dogwood, the return of the bluebirds, the songs of redwings and robins and the calling of the spring peepers. To some people spring meant strawberry shortcake; to others, muddy roads, plowed fields and rivers rising. In other minds it was associated with skunk cabbage, white butterflies, the red of swamp maples and the peeping of baby chicks. In still others, it recalled jessamine flowers, jack-in-the-pulpit, circus billboards, straw hats, kites flying, kittens, calves and housecleaning." I’ll go with the spring peepers, little frogs that sing with cheerful abandon in wet sloughs along woods and roadsides. When I hear them, of an early evening, I’ll know that spring is truly at hand. “Cheepa-cheep, cheepa-cheep,” they chorus— but in my mind's ear, their wordless song reminds me of my favorite Bach cantata. Cheepa-cheep! Wachet auf! Sleepers, awake!